Gen Sanmi Yorimasa is the historical figure Minamoto Yorimasa (1106-1180). "Son of Nakamasa and a descendant of Yorimitsu, became famous, both as a poet and a warrior. In 1153, he killed with an arrow the nue (a monster having the head of a monkey, the body of a tiger, and the tail of a serpent) which was seen flying over the imperial palace and shrieking horribly. A little later, he was name Hyōgō no kami. During the civil wars of Hōgen (1156) and Heiji (1159), he sided with the ex-emperor Go-Shirakawa, his protector. In 1178, he was raised to the 3rd rank in the Court (san-i), and as he shaved his head at that time, he was called Gen san-i nyūdō: he is best known under this name. His connections however with the Taira were becoming more and more strained; Kiyomori's tyranny brought about the climax. In 1180, Kiyomori wished to place his grandson Antoku on the throne, who was then only two years old, thus forcing his son-in-law Takakura to abdicate at the age of 20. Yorimasa then resolved to dethrone the Taira and to replace Antoku by the prince Mochihito, son of Go-Shirakawa. He secured the help of hte bonzes of Nara and despatched Minamoto Yukiie into the provinces to recruit adherents to his cause. The plot was discovered to Kiyomori, who opposed the conspirators with an army commanded by his son Tomomori. Yorimasa sent the prince Mochihito to Nara, whilst he, with 300 resolute men, intrenched himself near the river Uji-gawa, and prepared to receive the enemy. He gave orders to destroy the bridge (Uji-bashi), but the assailants forded the river and began a bloody fight. Kanetsuna and Nakatsuna, sons of Yorimasa were killed; Yorimasa himself, wounded by an arrow and forseeing certain defeat, went to the temple Byōdō-in and there, sitting on his fan, committed harakiri." Quoted from: Historical and Geographical Dictionary of Japan by E. Papinot, pp. 379-380. "This would be a deluxe issue to commemorate the actor Tokusaburō I's change of name into Arashi Kitsusaburō II, the incentive for the special performance as well. The poems above are signed Kitō, i.e. Kunitarō, Rikaku, i.e. Kitsusaburō, and by teh unidentified Oguraan. Somewhat less luxurious commercial - and possibly somewhat later - editions of this design are also known with the poems removed and substituted by the names of actors and their roles. These were published by the firm Yūgendō Kōbun and 'Yamaichi'." Quoted from: Stars from the Stage in Osaka by Matthi Forrer. p. 43, #23. "Almost exactly one year following the final performance of Kitsusaburō I in this role, the Edo actor Arashi Tokusaburō I staged a memorial performance of the same play during which he changed his name to Arashi Kitsusaburō II. Quite a few prints illustrating this event were designed by artists of all schools. 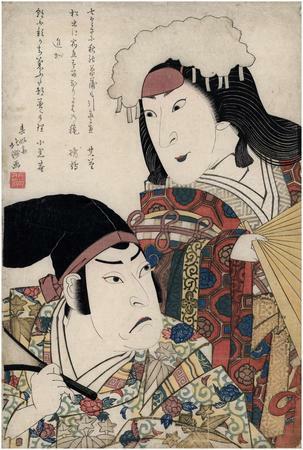 There are two versions of this print, one with the actor's names and roles (as here), and one which features three poems, two by the actors pictured and one by Oguro-an." Quoted from: Osaka Prints by Dean J. Schwaab,, page 94, plate 58. Ōsaka Kagami 大阪鏡 by Jan van Doesburg, p. 39. This is from a play performed at the Naka Theater in 9/1822 (Bunsei 5, 9th month). Schätze der Kamigata: Japanische Farbholzschnitte aus Osaka 1780-1880, MNHA (Musée national d'histoire et d'art Luxembourg), p. 38, #51.